Here we look at the most commonly advertised web developer jobs and the average salary expectations for each one. We’ll also give a brief introduction to each type of web developer job description and signpost some of the latest vacancies. The phrase web development is generic terminology describing the process of creating a website from needs analysis and concept planning through to build, testing and launch. 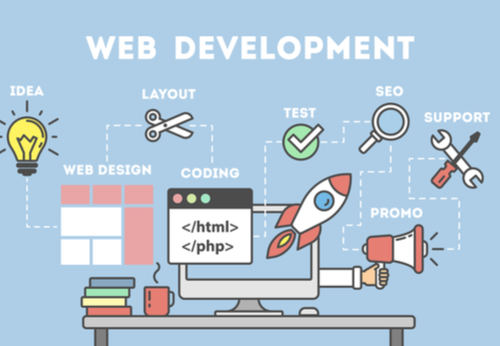 The role of web developer refers to someone on the technical side of a project, so such a professional may or may not be involved in the needs analysis, concept of visual design stages, but will be involved in its build. The website build is organised into various stages and involves different software tools and skillsets. A single web developer may take care of every stage, but for large, highly complex projects, one of more specialist web developers may be used at each stage. The website or application that end-users see and interact with is known as the “front end.” Developers for this aspect create pages and navigation menus for the website and organise systems that display content. Experts in this area use technologies like Python, PHP, Ruby on Rails, and ASP to build and maintain website databases, content management systems (CMS), servers, and e-commerce platforms. Web development roles can vary hugely between organisations and depend greatly on the size of the team in terms of whether niche specialists or generalists are used. Top web developers can receive high salaries and in high demand as more and more companies and organisations move their services and marketing online, and look to compete for a strong internet presence. This is the person whose main job description include programming and development for the creation of a fully functional website. Often primarily a technical role, but an understanding of the wider business needs and good communication skills can help this person to be less of a commodity and more a key player in the success of an organisation. Web developer jobs involving working with key stakeholders to establish website requirements, supporting them in organising text, visuals and multimedia content to make it engaging and accessible for their ideal visitors. According to PayScale.com, the average web developer salary ranges from $36,000 / £27,000 to $80,000 / £61,000, depending location and level of experience. The median is around $54,000 / £41,000, but recruiters report that high demand for job candidates is pushing salaries higher. Senior web developers can earn from $52,000 / £39,000 to $107,000 / £81,000, but experience with technology such as Java and C# can bring in even higher levels of pay. A back-end developer will focus on the behind the scenes aspects of a website. These professionals create the databases hosting the site content and work with the technology that runs functionalities such as search and e-commerce. Website features, speed and responsiveness are more part of the role that its cosmetic design, and they may require skills in languages such as PHP, ASP and Python, and frameworks such as Ruby on Rails and Django. Salary can range from $43,000 / £33,000 to $116,000 / £88,000, with a median of $75,000 / £57,000. Recruiters advertising full stack developer jobs are likely to be looking for generalists – ie people with both front and back end development skills and experience. Indeed.com cites the average full stack developer salary as $102,000 / £77,000 while SimplyHire.com has placed it as $68,000 / £52,000, so the reality may well be somewhere in between. However, as location, industry and experience make such a difference to salary expectations for this kind of role, advertised pay could be lower or considerably higher. Play Consulting Ltd. Source: Play Consulting Ltd.